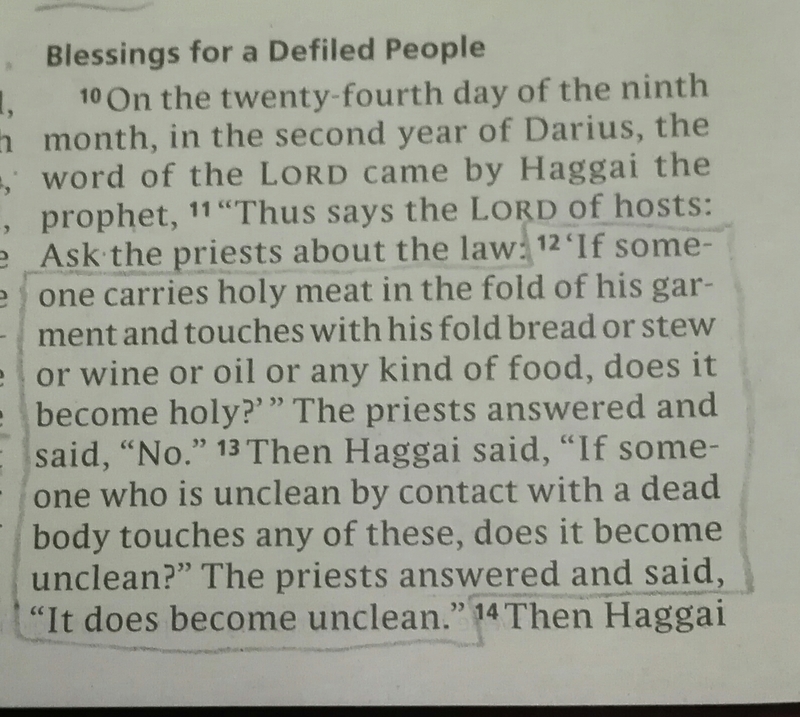 A few weeks ago in church we had a sermon on this passage from Haggai, which made the point that unclean things make clean things dirty, not vice versa. If you have muddy hands and touch your clean, white shirt, the mud makes the shirt dirty. The woman was unclean. She would have been separated from her community because of her illness and uncleanness, because everyone knew that if something unclean touches something clean it defiles it. But then she touched Jesus’ garment, and she was instantly made clean. A garment carrying holy food can’t make the uncleanness clean, but a garment covering a holy God can. Now the garments don’t even need to be touching the holy person, they can carry the holiness with them! Jesus changed the way physics works and he left his power with us. And in the power of the Spirit we can do even greater things than he did, just as he promised. There can hardly be a more familiar story in the Bible than that of Jonah, can there? Yet the teaching series my church is in at the moment has really revealed some things to me that I’d never seen before. 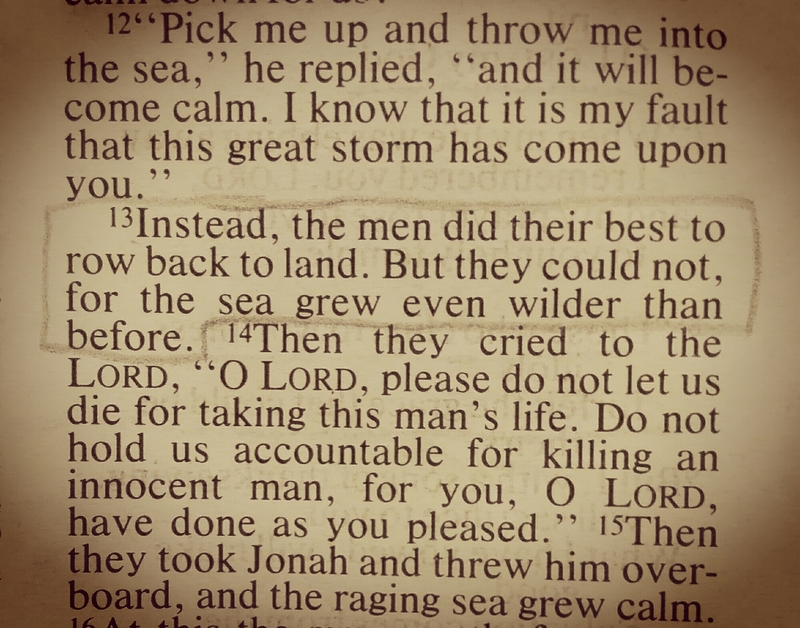 I hadn’t noticed that the sailors at first refused to do what Jonah told them. It reminds me of the stories in the New Testament when people come to Jesus and ask ‘What must I do to be saved?’ He tells them, and they go away sad, because that seems too hard. The sailors here ask ‘What must we do?’ They are given the answer, but they decide to keep rowing instead – they had given up all hope – rowing wasn’t helping, in fact, the storm had even got rougher since they had originally given up hope of a human solution (see v11) – but they decided to give it one last try anyway. That’s fair enough when the ‘remedy’ is that you’re going to have to kill someone in cold blood (though the sermon pointed out that actually Jonah could have jumped into the sea himself – there’s no reason he had to make the sailors do it), but it’s worth pondering that so often when we ask God what to do, he tells us, and we still keep trying it in our own strength anyway. We’re studying Jonah in church at the moment, and last week was on Jonah’s prayer from the belly of the fish. Jonah had been in the fish three days and three nights at this point. There was no sign that he was ever going to get out. His situation was just as hopeless as it had been… and yet, Jonah declared that God had saved him. Jonah’s salvation was evident in his change of heart, not his change of circumstances. He didn’t rely on everything looking and feeling good externally as proof of his salvation, but found freedom within the problems. 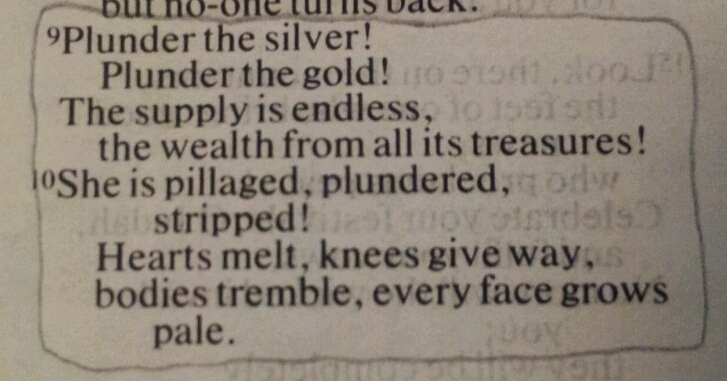 I don’t understand this verse at all. Do you think the word ‘us’ is just a typo? (I don’t think it can be, as it is the same in every translation I have looked up.) There is no note on it in my study Bible, but I can’t understand what it means – why would God tell the Israelites ‘implore God to be gracious to [God/the Trinity]’? I haven’t posted much from Zechariah, because a lot of it is a bit strange – lots of end-times-type prophecies that I don’t really understand or know what they’re supposed to teach me. 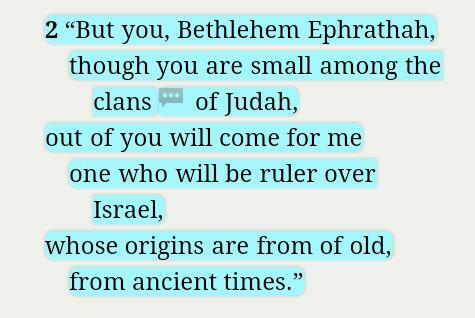 This section is also talking about the time when God will restore Jerusalem and establish righteousness. 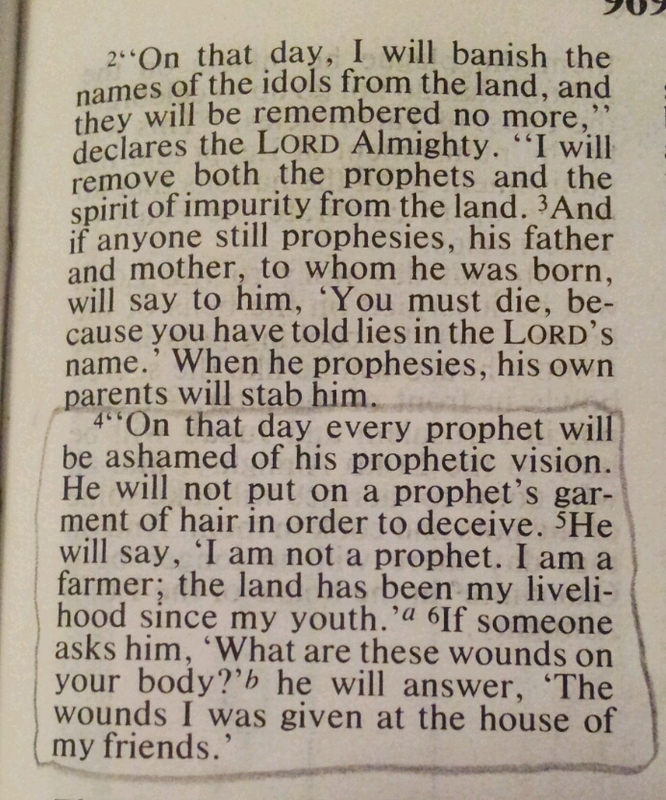 I thought it was interesting, though, that even when the false prophets stop prophesying, they will continue lying! God knows that their characters will remain unchanged – external pressure, even the threat of death, can modify behaviour, but it takes a change of heart for true repentance to occur. If the prophets had really repented, they would have confessed their sins to God and others, they would have acknowledged their past errors, but testified that the Lord is gracious and forgiving and had delivered them from their sin. Adding more lies to the false prophecy is not a solution. I wonder how often and in what circumstances I do this. What behaviours have I modified without changing the mindset that motivated them in the first place? How about you? This chapter began with the people of Bethel sending a delegation to Jerusalem to ask if they still needed to fast and mourn on the 5th month. Apparently this fast commemorated Nebuchadnezzar burning down the temple (2 Kings 25:22-25) seventy years earlier. Since it is clear from the next chapter that the temple hadn’t yet been rebuilt, the people of Bethel ought to have been able to work out the answer to their own question, really! Talk about a plan backfiring! 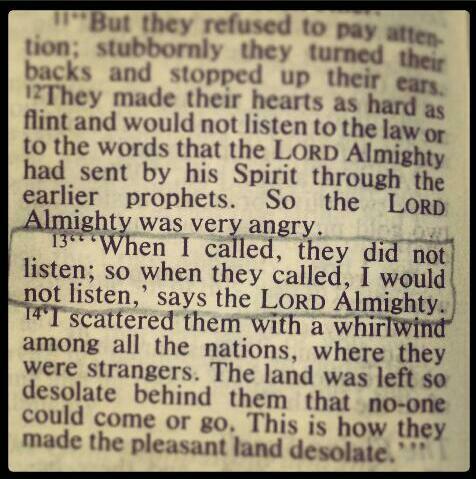 The people didn’t like that idea, so hardened their hearts, hence God’s response here. God is not a cosmic vending machine, sitting quietly in a corner while we’re off enjoying ourselves, ready to dispense blessings when we’re feeling a bit tired or hungry. But also this verse clearly doesn’t mean he is never going to listen when his people cry out to him again – particularly since in the next chapters he starts talking about the restoration of Jerusalem and a time when the city will flourish. You will seek me and find me when you seek me with ask your heart. God doesn’t want half-hearted followers, but people who seek him with everything in them. The word ‘awesome’ caught my eye in this passage. It’s overused today, and usually used to describe something very good/enjoyable, particularly if that thing is unexpected. So I’m picturing the wicked, disdainful, mocking people of Moab and Ammon seeing the Lord’s vengeance and destruction and saying ‘awesome!’ in the tone of Californian surfer-dudes who have just seen someone ride a really big wave. It’s an odd mental image! I’ve been pondering what the word really means in context, though (I actually read this yesterday, but had to leave for work in a rush and didn’t feel I’d paid it enough attention to try to post then). What is the verse saying? 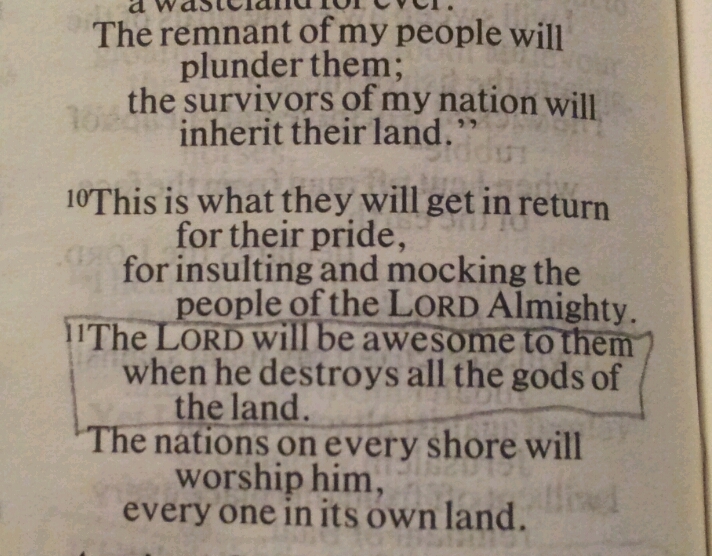 How will Israel’s enemies react to God’s destruction? They will be filled with awe – stunned, amazed. Their experience of deities is idols – statues carved of wood and stone that can’t speak or think, let alone act. In their mindset, might is right: the strongest, richest, most populace nation wins; there is no help coming from anywhere. But God will show up and blow their minds, blasting their neat categories and explanations out of the water. He will fight for his people, and he will win, and there will be nothing the enemies can do about it. Truly our God is an awesome God! 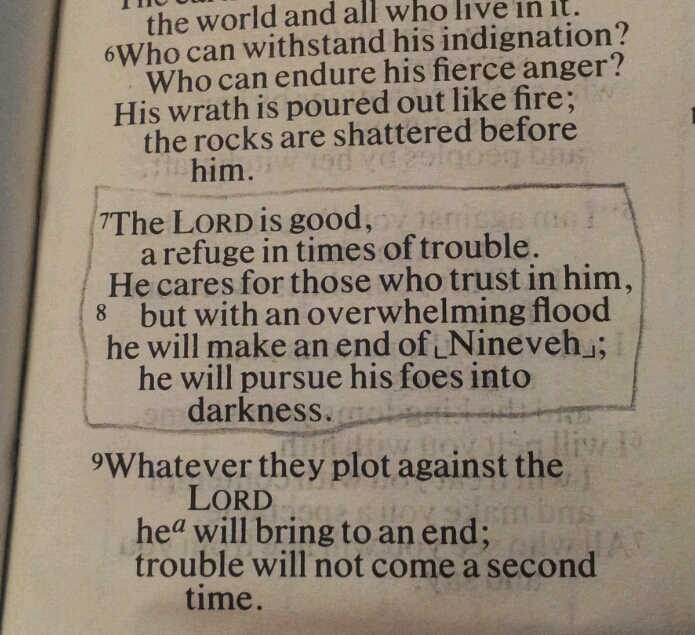 I love these verses. There’s a blog post going round at the moment arguing that Western Christians should stop saying ‘God is blessing me’, because we need to stop thinking of blessing in terms of health, wealth and happiness – it implies that God is not blessing his people who are living in poverty or under persecution. While I agree with the sentiment, I think that to stop saying ‘God is blessing me’ is the wrong solution – we just need to recognise his blessing in every area of life, not just when things are going well. 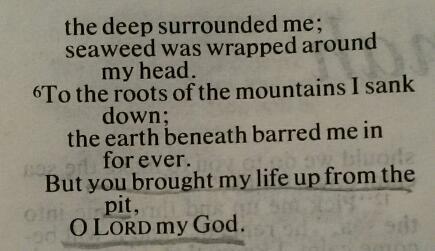 God blesses us by his very existence, by the fact that he loves us and sent his son to die for us. 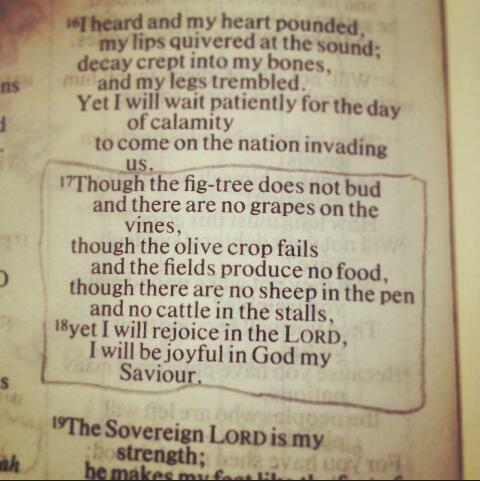 Whatever our circumstances, he is still worthy of praise, our saviour and our God. Hard to pick out one section of Nahum to focus on – it’s all prophecy about the overthrow of Nineveh who, as Jonah suspected, didn’t change their ways for very long after he preached to them with such success (approx 150 years earlier). It’s hard to tell, reading an English translation of the original words, but it seems as though Nahum enjoyed playing with words and language. I picked this section because I love the shift from the soft, gentle, loving words about God’s goodness to the fury of the ‘overwhelming flood’. I’m not sure what the ‘take home’ point is for us today – good is a good of justice and he will repay the wicked with the same measure they use/d to mete out wickedness, maybe. Maybe God just included it because, although it has the same message as many other passages of the Bible, it says it in a powerfully creative way and he just enjoyed the use of the language. Who knows? Here’s another fun bit – it sounds like performance poetry, though I imagine the Ninevites didn’t enjoy it quite so much! Verse 2 is very familiar from Christmas readings over the years, but I don’t remember ever hearing/reading verse 4 before – maybe it does always follow on but I switch off by that point. 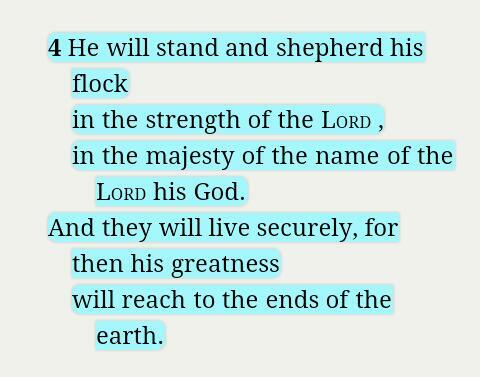 I like the idea of the shepherd standing and tending his flock with majesty – majesty isn’t usually a word you hear associated with shepherds, is it?! “Israel will be abandoned…until the rest of [Jesus’] brothers return to join the Israelites”? My study Bible is unhelpfully silent on what that might mean. Does it actually mean Jesus’ brothers? 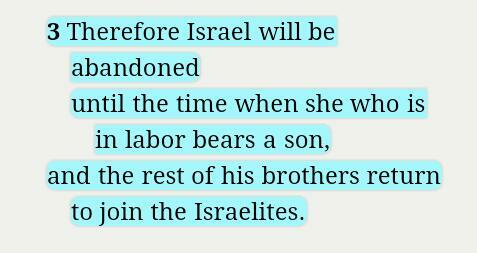 My little Bible (NIV 1984) just says “until the time when she who is in labour gives birth”, making it even less clear who the ‘his’ refers to – Israel’s, maybe? Verse 2 seems to suggest that the end of Israel’s abandonment will be the birth of the promised ruler in Bethlehem, but verse 3 appears to contradict that.